Hand-knotted wool pile, on silk warp and weft, with areas brocaded with metal thread; asymmetrical knot, open to the left; 600-756 knots per sq. in (9,024-11,544 per sq. dm). END FINISH: Lower: part missing but there are the remains of a tapestry-woven band with an inscription in black and silver thread. Upper: cut. 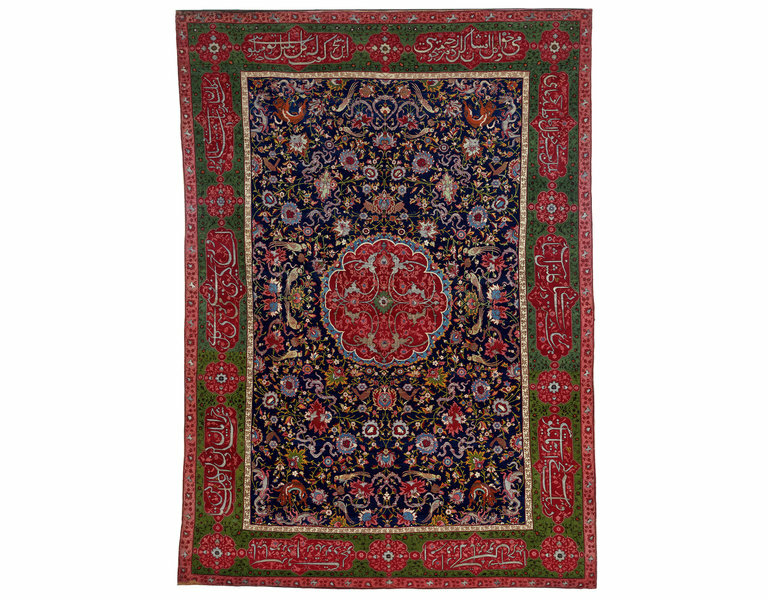 Dating from late sixteenth-century Iran, this is an extremely fine and beautiful carpet, with an intricate floral design filled with wild creatures, and verses of Persian poetry all around the borders, highlighted in metal brocade. The lines quote the great Iranian poet Hafez (d.1389), and they describe a blissful world of gardens, nightingales, roses and wine. This poetry was certainly chosen to suit the design and intended purpose of the carpet itself, to be a beautiful place to sit together with friends, in a private garden, reciting romantic verses: “Call for wine and scatter roses: what do you seek from Time?/ Thus spoke the rose at dawn. O nightingale, what say you?” The verses are emphasised by the scale of the fine calligraphy, by the use of silver brocade lettering against a dark red background, and by the distinctive formatting: each half-verse is placed in a cartouche, laid against a green border. The central medallion repeats the red and pink background, with a leafy design also overlaid with gleaming metal brocade. 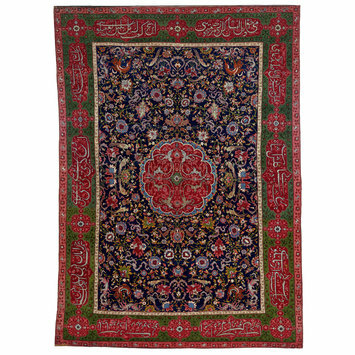 The carpet is attributed to the late sixteenth century, and the Safavid court of Iran (which was then based in Qazvin). At this time, carpet weaving had reached an extraordinarily high standard of design and technique, and the Safavid shahs commissioned the finest carpets as pious shrine donations, personal furnishings and suitably impressive diplomatic gifts to other states. Known in scholarly literature as "the Salting Carpet", this famous carpet belongs to a larger carpet group which has long been debated by art historians. A diverse set was collectively named “Salting Carpets”, named after this example in the V&A, although they are now understood as a more complex cluster with a wider date-range. Today, consensus attributes the central group to late sixteenth-century Iran, on the basis of style and technical structure, and by association with recorded diplomatic gifts from Safavid Iran to the Ottoman empire, including the embassy sent in 1567. Two carpets are known to have been in European collections (in Poland and Spain) by the seventeenth century, but the majority were not published until after the 1878 international exhibition in Paris: then the art-dealer Albert Goupil displayed several at his Galerie Orientale loan exhibition. George Salting bought this carpet from the London-based art-dealers Murray Marks and Durlacher Brothers, between 1880 and 1883. Although not proven, it is suggested that by 1878, these carpets had very recently come from Istanbul, having been sold out of the Ottoman palace stores. One explanation for this was the sudden instability in the city, which was under threat of the Russian-Turkish war of 1877-8: the British press certainly noted a sudden influx of other Turkish textiles on the art market as a direct result of that civilian fear. 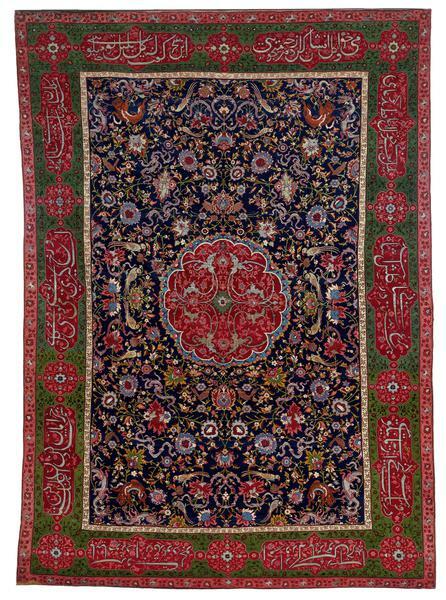 These carpets are exceptionally significant though, as Safavid court products of late sixteenth-century Iran. Field: central lobed medallion with half-palmette scrollwork in metal thread and pink floral scrollwork on red ground, set against main field of dark blue ground. The main field is filled with cloudbands, floral stems and lotus flowers containing animal heads, as well as brown birds (perhaps the nightingales referred to in the surrounding poetry), green parrots, Chinese-style lions and dragons. Inner border: white ground with light brown flowers and stems. Outer border: light red with red floral scroll. INSCRIPTION (transliteration): Read from top right. 5. Har murgh bi-dastan dar gulshan-i shah ayad bulbul bih ghazan khwani hafidh bih du'aguyi. 1. Call for wine and scatter roses - what do you want with Time? Thus spoke the Rose at dawn. Nightingale, what do you say? This carpet was initially on long term loan to the South Kensington Museum (today called the V&A), from 1883, and it would be over twenty years before the museum officially acquired it, in 1910. At that time, the owner was the art-collector George Salting, who loaned so much (particularly Chinese porcelain) to the museum, that a dedicated gallery was organised just to display his collection. After Salting’s death in 1909, the collection was bequeathed to the V&A on a permanent basis. The carpet was discussed as “the Salting Carpet” in later scholarship (see below), but it was not the only carpet in the Salting Bequest. Anon., "On Oriental Carpets. Article 1.-Introduction", The Burlington Magazine, 1/1 (March 1903) pp.77-78 colour plates. Edouard Lièvre, Musée graphique pour l'étude de l'art dans toutes des applications, IV (Paris: 1880-3) pl.81. Ana Raquel Santos, The Discovery of three lost 'Salting' carpets: Science as a tool for revealing their history, Master thesis in Conservation and Restoration, Universidade Nova de Lisboa (Lisbon 2010). John Mills, "The Salting Group: A History and a Clarification", in Murray L. Eiland and Robert Pinner (eds. ), The Salting Carpets, Oriental Carpet and Textile Studies 5/2 (1999) 1-17. Jennifer Wearden, "The Riddle of the Salting Carpet", Oriental Art 43/1 (1997) 21-27.